Fill a medium bowl half with ice and half with cold water. Add the fennel bulb and let stand until crisp, about 20 minutes. Drain well and pat dry. Meanwhile, in another medium bowl, whisk the lime juice with the fish sauce, 1/4 cup of water and the sugar until the sugar is dissolved. Whisk in the scallion, sesame seeds, chile and garlic. In a large saucepan, heat 1 inch of oil to 375°. One at a time, crack the eggs into a small heatproof bowl and very carefully slide into the hot oil. Fry until the whites are just firm but the yolks are runny, 30 seconds to 1 minute. Using a slotted spoon, transfer the eggs to a plate and gently blot with paper towels. In a large bowl, toss the fennel with the cilantro, mint, bell pepper, cucumber, vinegar, fennel fronds and the 1 tablespoon of oil. Spoon the nuoc cham into bowls. 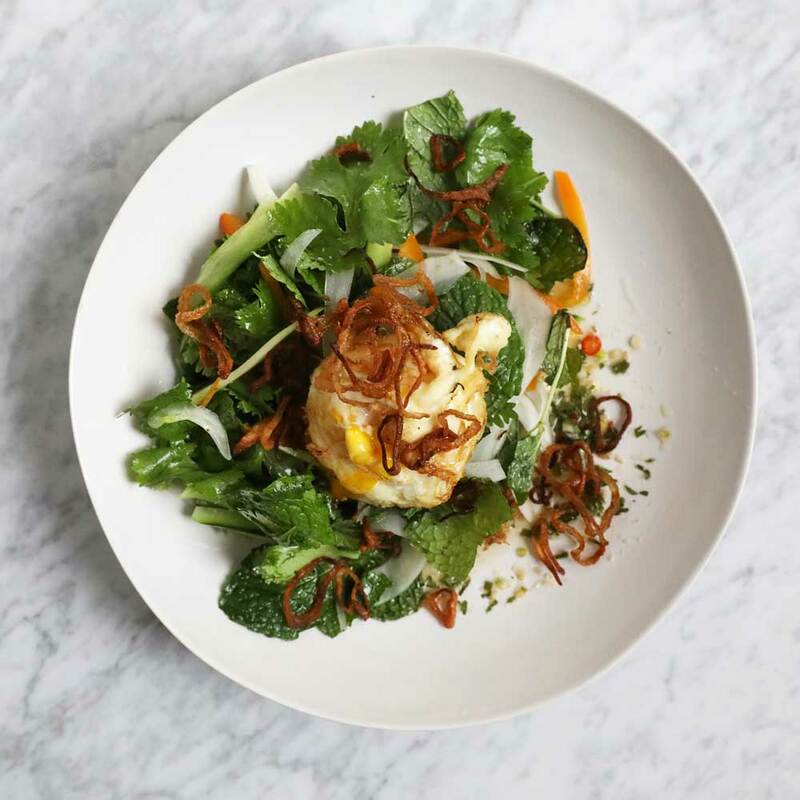 Top with the eggs and salad, garnish with the shallots and serve right away. The nuoc cham can be refrigerated overnight. Bring to room temperature before using. Review Body: I love the Vietnamese cuisine, I will be trying this. Review Body: I'm not a fan of all those vegetables on top of my plate but as far as the egg side goes, it looks really good.